RIP. Alvin Epstein, a true giant of the theatre, has shuffled off this mortal coil and we will miss him immensely. Seen here on Thanksgiving Day with Ernest and Kerrin Thompson, Alvin was set to play Professor Jacob Korber in PARALLEL AMERICA, a role Ernest wrote expressly for him. Congratulations, we’ve now entered the annals of Amazing Movies That Got Delayed. You’ve all heard gruesome tales of how many years it’s taken some films to get completed, how many stars some have gone through, directors and studios. And how many lost their financing. Some of you may have been involved with Ernest’s movie HEAVENLY ANGLE and know that that very subject is a major plot point. And the story still had a happy ending. As will PARALLEL AMERICA. The investors we thought were a lock turned out not to be, but we’re big on believing that things happen for a reason and when cameras finally roll, this movie will be more than ready. We have every location lined up, including, thanks to the generosity of the cities of Portsmouth and Kittery, Memorial Bridge, which connects them. We have all of our vehicles and signage and the Wicwas Grange Hall in Meredith Center, the New Hampton Town House and the Jaffrey Town Hall, all because people believe in our film and want to be as helpful and welcoming as they can. And extras! So many of you have volunteered not only your talent and time but your enthusiasm as well and we can’t tell you how gratifying that is. Everyone knows our Emmy-winning Gordon Clapp on the far left and the legendary John Davidson, far right, and Oscar winner Ernest Thompson beside him. 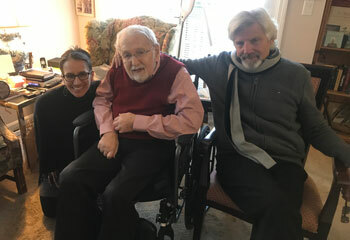 That’s the critically-acclaimed Lisa Bostnar in the center, whom you may have seen on “Law and Order” or “Blacklist” or in one of her many indelible performances on stage in New York or locally at Peterborough Players. 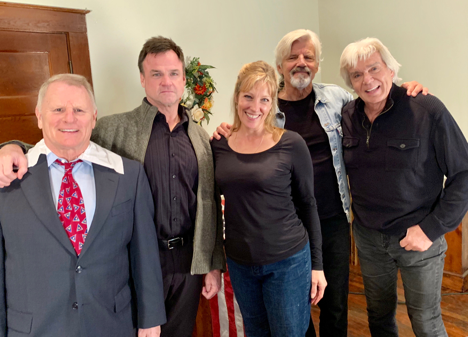 Our newest addition, on her right, is Doug Wert, whose own résumé is an impressive one, from “Star Trek: The Next Generation” to a long list of theatre roles. And that’s our fabulous Jackie Abbott playing Megan and imploring you to vote. DON’T NOTE VOTE. Since Gordon’s busy with two plays in a row and rumor has it that winter’s on its way, we’re on hold till warmer weather. Which gives us more time to right the ship and you can help. Please continue to share the link to our GoFundMe campaign and spread the word about this wonderful project we’re proud to have you part of. Follow uson Facebook and/or Instagram and check in to our website for the latest details. Stay tuned, stay in touch, and keep the faith. And don’t forget to vote on Tuesday. To everyone who has reached out to us in the past few weeks, auditioned for PARALLEL AMERICA, or discussed being part of our crew and volunteer support team, thank you. All of your names are in our database. We have received an overwhelming response and are working hard to put all of the pieces in place, but we still need to raise additional funds to begin filming. If you’d like to help us make that happen, please click here to visit our GoFundMe page and share it with anyone and everyone you think might be interested in this unique opportunity. If you auditioned for a particular role, first of all, please know how impressed Mr. Thompson was with the wide range of work we were privileged to experience. Because of our delay in commencement of principle photography, not all roles have yet been filled; please bear with us. 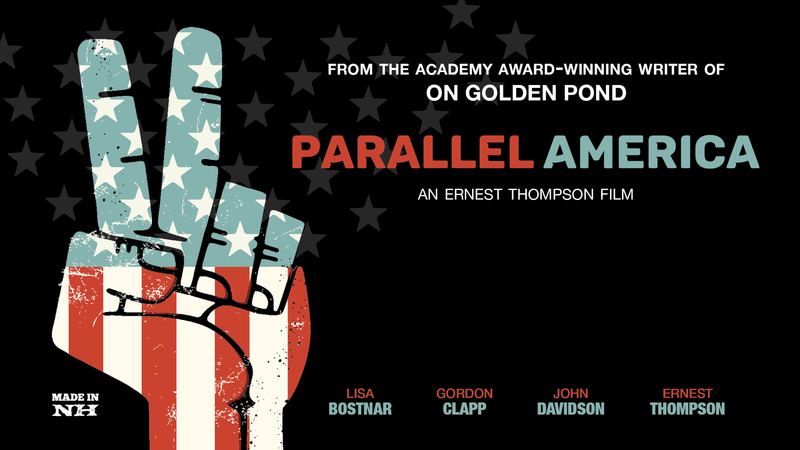 In some cases, Mr. Thompson may want to see you again; in others, when our final decisions have been made, we hope you’ll still consider being part of the PARALLEL AMERICA family. If you interviewed or sent your qualifications to be a crew member, we are still in the process of staffing this movie. When we have a better fix on our budget and our shooting schedule, we will circle back to you folks, as well. We are gratified by the enthusiasm expressed and sincerely hope to include as many of you as possible. For those of you who have stated a desire to be extras in the movie, we intend to use you all! When we are locked into our locations, by region in New Hampshire, we will reach out to you with specific information about where and when. Instead of emailing and calling, we strongly recommend you join us on Facebook and/or Instagram for the latest details, unless you are not in our system, then please write to us here. We are a small operation, with limited personnel at this juncture, and so our response time is limited. What an honor it is for us to promote filmmaking in our beautiful state of New Hampshire and to showcase the extraordinary talent and commitment of our amazing film community. We appreciate your patience during this exciting time and look forward to working with all of you in some capacity. See you on the set!